In the last blog, we talked about using visual aids or props to grab the kids’ attention. Once you’ve got it, you want to keep it. Speak loud and clear so everyone in the room can hear you. I get a big kick out of startling the kids when I read a short excerpt from Curse at Zala Manor that begins with a loud “Arrggh!” from Musky, the zombie. Be dramatic. Kids love it, and they’ll pay closer attention. Use different voices for the different characters. I love doing Stumpy the peg-leg skeleton’s scratchy voice when he says, “Give me back me key, wench!” from that same Zala Manor excerpt. It always gets a good reaction from the boys! Keep it short. The length should vary according to what grade levels you’re dealing with. If you make a mistake, smile and shrug it off. Kids don’t expect you to be perfect. We all mess up when reading something out loud. They’ll take your cue and follow your example the next time they stumble over the words when reading out loud in class. If you have props that go along with the reading, don’t forget to use them or gesture. I had a cheap plastic pirate’s hook from the dollar store that I held while reading Shel Silverstein’s poem “Captain Hook” from Where the Sidewalk Ends and made sure to reach to my toes and put it up to my nose as I read those parts. Arr! The rascals loved it! Use as much eye contact as possible. Be dramatic. Project your voice. These are pretty basic tips. I started reading aloud to classrooms when my children were in elementary school, just to promote literacy. Dressing up in a costume or wearing a cool hat that tied in with the story made it loads of fun. Like I said in my last post, props are a big help. A picture book that can be read in five minutes or less is perfect. Be sure to hold the book up with the pictures facing the audience. That means you have to read it from a side angle, so be sure to practice ahead of time. Share one of your own short stories or an excerpt from your novel, and if you want the kids’ input on it, tell them ahead of time so they can listen carefully and tell you what part they liked best. I’m more comfortable speaking to a classroom instead of an entire school. 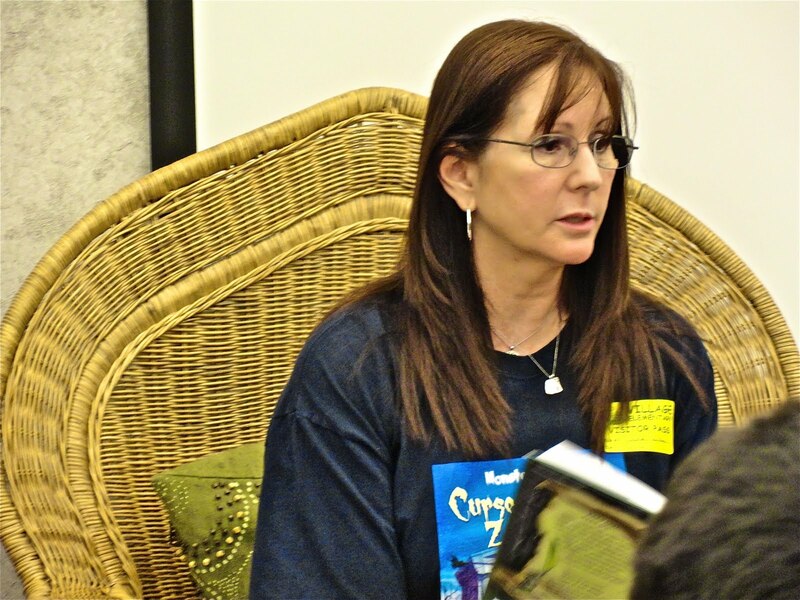 The only time I had to speak to an auditorium full of kids was with my two Monster Moon co-authors, Kathy Sant and Maria Toth. Being part of a team was the only way I could pull that off since just the thought of speaking to a large group makes my heart race, my hands shake, and I even get lightheaded at times! I speak to a school assembly. Just me, myself, and I. So, baby steps, toe by toe, inch by inch, word by word. It keeps me moving forward. And kids are great to interact with. Author visits are truly rewarding and they give you get lots of fuel to keep your stories going. 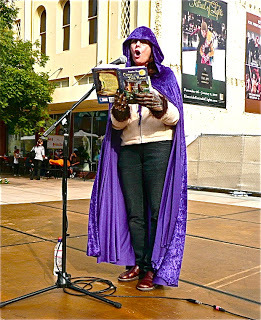 Below, storytelling cape and werewolf hands for props, reading an excerpt from the first Monster Moon book at the Downtown Riverside Kids Jam. 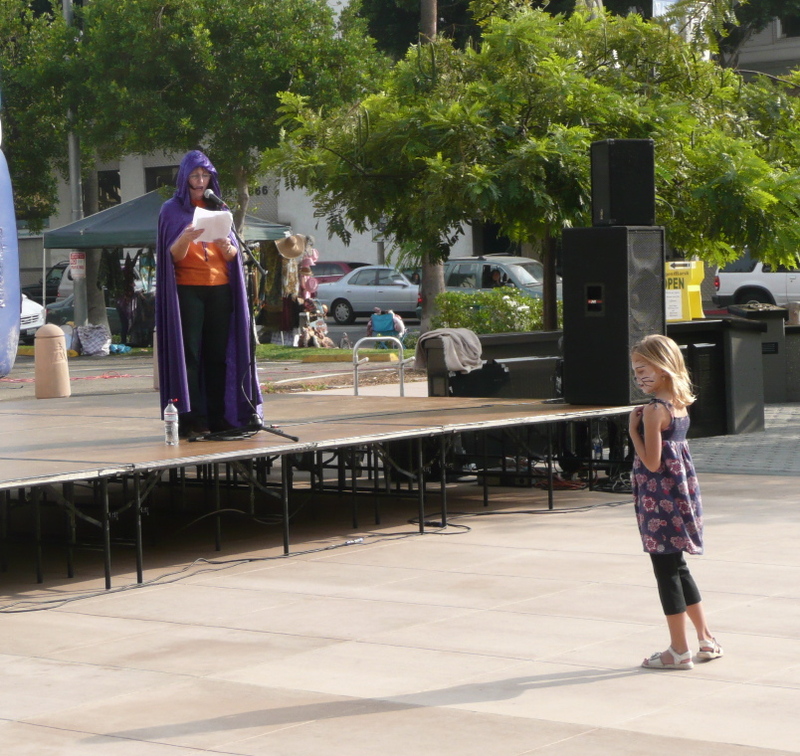 People sat way in the back in the plaza (which made reading the excerpt less intimidating), but this little girl made my day when she came right up to the stage and listened as I poured my heart into reading “Cyclops Clyde.” Hey, if we can make a difference in one child’s life, that’s a big deal in my book! This is one of my favorite photos from events we’ve participated in. I’m always looking for good ideas or tips for author visits. Do you have any? How about a funny incident that happened when you were speaking to or reading to kids? The next post will cover different topics and ideas to talk about at school visits. Thanks, Wen! I thought she'd be crying her head off when she saw the makeup, but she recognized my voice and was kind of perplexed! So much fun! I heard from one friend who was having trouble leaving a comment. So I'm testing this to see if I'm able to now. The other day I had to change the settings under "Comments" because not only was I unable to leave a comment on anyone else's blog, but I couldn't even leave one here on my own blog. Dang! I received another email from a friend who couldn't leave a comment. So now I changed the settings under "comments" to the pop-up window. I hope this fixes it. I hope I'm able to leave this comment. This is another test. Darn it! There's always a computer glitch thrown in the day, eh? Ahhh…. Julia has the coolest and most silliest grandma!Your fun post stirred up some storytime memories.Sweetest moment…while reading to preschoolers, I used to wear fun & fuzzy character slippers. A little girl who was blind crawled over and giggled as she felt my slippers. Then she stood up and started to feel the book pages. She was so sweet. And afterwards I added pic books w/textured pages.Funniest moment… while reading a spooky excerpt of Curse at Zala Manor, a student leaped from his chair and bolted out of the classroom! Everyone busted up laughing including the teacher.Love your post & all of the fun pics! Yay, Maria! I'm so glad you tried to leave another post. I guess that re-publishing the post got the kinks out of whatever was wrong with the comments setting. Sheesh! Those are great memories from your school visits. Thanks for sharing them. Very nice and very useful tips. I speak to older kids, but I think these suggestions will work for almost any audience.One thing I always ask teachers or librarians is, "Have the kids read the book?" OR "Have you read excerpts to them already?" That helps me know how much background to go into.The teens seemed to like when I talked about being a teen way back when and showing them pictures of how I looked then–a sort of before and after with the before being kind of dorky and the after kind of old. I love reading to my kids and acting out different characters – and these tips are great. I write for older kids, 9 and up – any advice that age range if I visited a school? I know Paolini did school visits to get attention for his book Eragon. Thanks, Lee, for the reminder about checking to see if the kids have read the book or excerpts. That's an important point. I think it's great that you're doing school visits with teens. They need role models like you!Margo, I get a big kick out of talking to 5th & 6th graders, and even 7th & 8th. They still love props (especially the werewolf mask) and they like to hear about spooky stuff and gross things, like the mummification process (which my co-author, Dr. Kathy Sant, explained at a visit one time when a 5th grade girl asked what a mummy is. Well, Kathy explained it, and it's too gruesome to get into here, but the kids were hanging on to every word. And I learned some great info, too! Your costume is fantastic! I can imagine that classrooms of kids are thrilled when you show up to read. I'm going to file away these excellent tips. Great tips! And that is certainly one scary outfit! Thanks, Nutschell. The baby recognized my voice but the makeup threw her off! I hope you have a nice Memorial Day. Talei, yes, staying animated helps, no matter how old the audience is. Everyone loves to be entertained, and using different tones and animation when reading aloud keeps them interested. Kristen, thanks for stopping by. I'm glad you found the tips useful. Now I need to figure out what works best with Skype visits as far as props. I haven't done one of those yet.Hi Tali! What a nice surprise to have you visit my blog! The makeup is a bit scary, even though I tried to make it funny, too! Wonderful tips. It must be fun interacting with kids at the readings. Thanks, J.L. I have a blast interacting with kids! hehe I love the outfit. It's awesome! Great tips too. Very helpful. Thanks, Lynda. Glad the costume didn't scare you away!